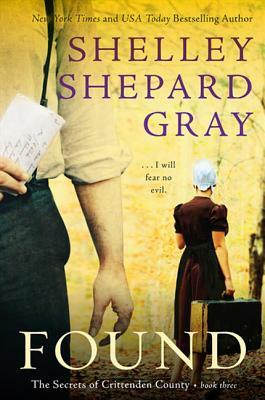 Found is the final book in the Secrets of Crittenden County trilogy by beloved author Shelley Shepard Gray, who writes powerful novels set in a world of strong faith and simple living. The New York Times bestselling author of the popular Sisters of the Heart and Seasons of Sugarcreek series immerses her readers in the Amish life, like fellow bestselling authors Beverly Lewis, Wanda Brunstetter, and Cindy Woodsmall. In Found, Gray’s unforgettable trilogy of what happens when a terrible crime that strikes a close knit Amish community comes full-circle, “Englisher” Detective Luke Reynolds discovers the identity of Perry Borntrager’s killer and the community must come to terms with the surprising revelation. It's a remarkably heartwarming conclusion to this series, and readers will not be disappointed. Dynamic characters and a riveting story wrap up all the loose threads of this series into a nice, neat package of books you must have for your collection! A great end to a perplexing mystery!